Two weeks ago I went in and had my first appointment with the lovely ladies at Bobbi Brown. I should start by saying that my relationship with Bobbi predates any blog ever existing, let alone FFG. This is a brand and a woman that I worshipped from the word go. Even when I had no idea what to do with makeup, I knew this was the creme de la creme of solutions for enhancing natural beauty. In short, saying I'm a fan would be the understatement of the year. Fast forward in time, and you find me in present day sitting in a chair with the experts of Bobbi Brown and taking tips on all the things I'm doing wrong with my makeup regime on a day to day basis. I walked away with so many notes on my iPhone that the printed version came to over three pages of text. Seems I still have a lot to learn when it comes to skincare and the magic of makeup. I was going on and on about what I would like to see "corrected" or "enhanced" and I was stopped dead in my tracks when the team wanted to assess my present regime. I was asking specifically about covering these annoying little bumps under my eyes, my only real complaint about my skin, and was asked what I was using for eye cream. "Eye Cream?" I questioned. "I just use regular cream for my whole face." Well, I might as well have taken a picture of Bobbi Brown and stood right on it in the showroom. The looks I got were a mix of shock and wisdom- wisdom they were about to impart that would change my life. Ladies, turns out there is a reason we are paying the big bucks for two separate creams on our faces. Call me stupid, but I had no idea. And yes, this might be the most basic thing you ever read on FFG, but on the off chance that you do not know this, I feel it my job to impart this piece of information to the masses. YOU CANNOT USE THE SAME CREAM UNDER YOUR EYES THAT YOU USE FOR THE REST OF YOUR FACE. This would be like using your body lotion as face lotion. You wouldn't dream of it, right? Well, all these years I've been doing exactly that. And, because my undereye skin is so sensitive, I was having a reaction to creams that were way too harsh to treat this area of the skin. I was causing bumps to develop - little unsightly irritations. 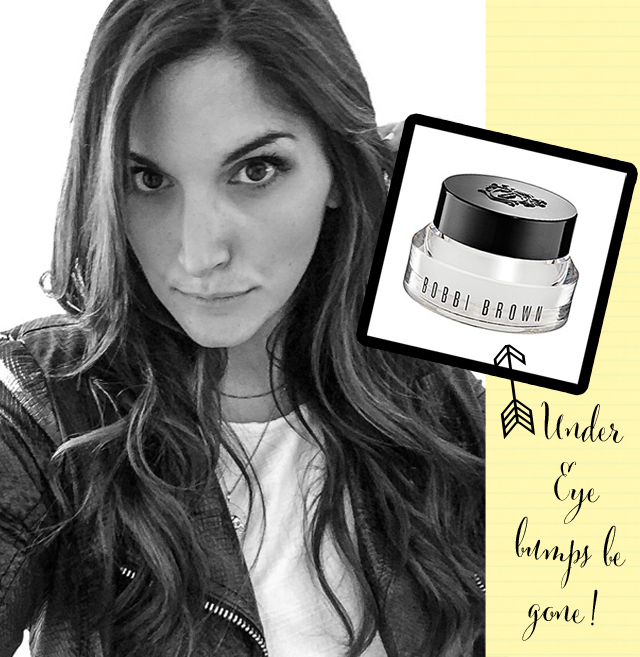 After two weeks of using Bobbi Brown's Hydrating Eye Cream, the bumps are 100% gone. I almost didn't believe it when the makeup artist told me this would happen. I prayed it would be the truth and the beauty gods have answered. And so, to you dear reader, I pass on this golden nugget. Get thee to Bobbi Brown and secure yourself this wondrous addition to your beauty arsenal. Not only will it help get rid of unsightly bumps that may have developed over the years, it also acts as the perfect cream to prevent signs of aging, as well as the perfect primer to ready the eye area for a clean application of concealer. This has to be my new favourite product when it comes to beauty. Just love, love, love it!